Myron Groover (MLIS '12) was recently named a 'Mover & Shaker' by Library Journal due to his work in information policy and ethics. Presenting the New iSchool Website! Over the last month, the school has been hard at work developing a new website with increased functionality for applicants, students, faculty and community members. Please take some time to look around. 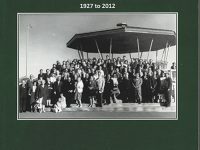 The Canada IFLA adventure: 85 years of Canadian participation in the International Federation of Library Associations and Institutions, 1927 to 2012. By Judith Saltman With Contributions from Dan Gillean, Kathleen Jamie McCarthy, Myron Groover, Jack J. Unrau, and Rachel Balko. 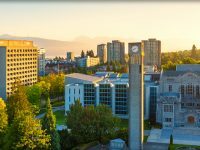 This year’s winner, Ebony Magnus, was honoured for her work term at the UBC Library Humanities and Social Sciences Division. Over the course of her two-term co-op assignment, Ebony taught 47 first-year library instruction sessions and saw an opportunity to use data collected during these workshops for an information visualization project required for one of her courses. iSchool students can now use the Greig laboratory for research. Luke McLeod has been recognized for his work as an Information Specialist at the Canadian Intellectual Property Office (CIPO) Patent Branch. Luke was awarded for his contribution to the identification and implementation of the Library Discovery Tool, which allows patent examiners to quickly retrieve literature necessary for patent reviews. The 2012 MLIS SLAIS Student of the Year award has gone to Danielle Westbrook for her work at UBC Library where she took on a number of responsibilities as a Technical Services Co-op Student, including researching and conducting a literature review on creating and managing core library collections. Helen Brown has been awarded the 2012 Arts Co-op MAS Student of the Year award for her as an Archival Project Coordinator for the Playwrights Theatre Centre. PTC had a wealth of information that needed to be organized, including thousands of photos taken at the theatre company within the past 40 years. Helen’s job included researching, developing and recommending a records management policy, digitizing and organizing the photograph archives, as well as planning events to help identify subjects in the photographs. 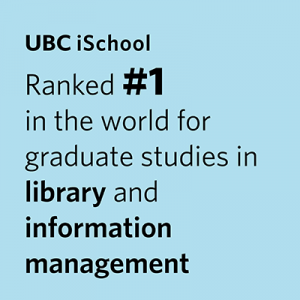 UBC iSchool students have distinguished themselves as scholars on the national and international stage, earning several awards for academic promise and excellence including Canada Graduate Scholarships.